Ladies and Gentlemen! Roll up, roll up, and feast your ears and eyes on the cheeky nonsense what is – The Cockney Gents! Join them for a raucous sing-along of all your favourite pop tunes in the Cockney style! Play along to all the hits with your very own Gents kazoo! Wow your mates with your lyrical knowledge of bad 80’s pop cheese! Marvel at two geezers who really should know better! 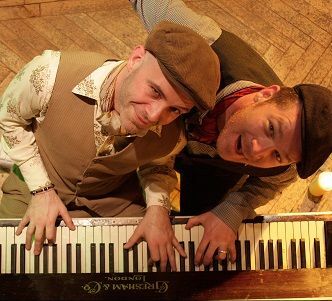 Updating the piano sing-along for the twenty-first century, The Cockney Gents cover tracks from Kylie Minogue to Tom Jones, Talking Heads to The Monkees and Amy Winehouse to A-Ha. In a Cockney knees-up style The Cockney Gents lead their drunken crowds through the full history of popular music. 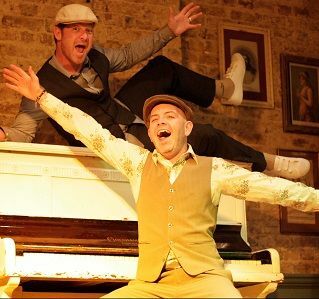 Cockney Vocal & Piano Duo – The Cockney Gents are available for private parties, festivals, street performances, corporate events, TV appearances, promotional work and, well, just about anything else you want to offer us really! They are London based but are happy to travel. The Cockney Gents perform for 1 hour. ★ Roll up, Roll up! The Cockney Gents were a great addition to our experiential campaign. They were up for a challenge and managed to create an atmosphere even in the most difficult of locations! The Cockney Gents are great fun and reliable – we will certainly look to use them again in the future both for internal marketing and client facing campaigns when appropriate. 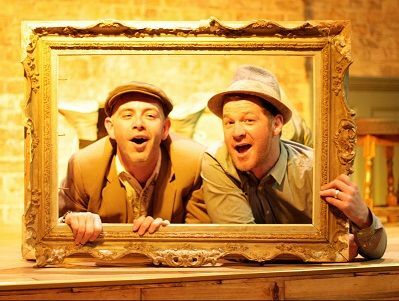 We have booked The Cockney Gents for several events, both public and corporate. They are always well received by any audience as their performance is so unique and engaging- it’s impossible not to get involved! By the end of their set the whole audience is on its feet clapping, singing and playing kazoos! The guys are professional, reliable and easy to work with, and we look forward to working with them on many more events in the future, such is their versatility and wide appeal to audiences of all ages. Legends! If I could use The Cockney Gents at every event I would. Having the guys on board guarantees that the party goes with a swing – our clients have been thrilled with the sets and on a personal level I find working with the guys really fun, alongside their act they are always happy to give that little extra, even if that means standing in a flower bed in the freezing cold, pretending to be frozen when the Birthday Girl discovered them!